Copyright 2006 P. Anthony. Reproduction prohibited without authorization. Although it may be difficult to imagine, it is entirely possible that the creation of a non-Apostolic sacrilegious worship service has not been the most reprehensible action undertaken by Newchurch's liturgical barbarians during their seemingly interminable reign. The substitution of the Liturgy of the Hours for the sacred, Divinum Officium (Divine Office), the official public prayer of the Catholic Church, has been an even greater travesty and abomination than the promulgation of the invalid and Protestantized Novus Ordo "Mass." 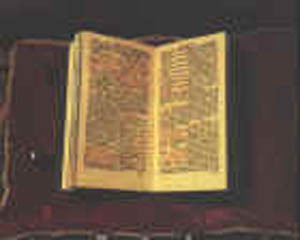 From its origin in antiquity, drawing on passages from the Old and New Testaments, venerable prayers and sermons from the most illustrious Fathers and Doctors of the Church, biographies of the Martyrs and Saints, the Divine Office has nourished the souls of countless Catholic religious, clergy, and laity, in which one text describes as "the work of the Holy Spirit of some 3000 years." Just as important, the Divine Office has been the most efficacious manner for Almighty God's creatures to worship their Creator, which, although the modern world thinks otherwise, is the ultimate purpose of life. It is that daily round of public vocal prayer appointed by the Church to be recited in her name by all clerics in major orders, by all those who hold any ecclesiastical benefice, and by almost all religious, men and women, in solemn vows. The prayers of the Divine Office are divided into canonical Hours and originate from King David's pious practice of worshipping Almighty God seven times daily as recorded in Psalm 118: "Seven times a day do I praise thee," and "Midway through the night will I rise to praise thee." In them [Lauds, Vespers] we have an unbroken link with the seers and prophets of the Old Testament. There is development but no break, and Christian vocal worship is seen as the continuation and the perfecting of the Temple worship, since the Christian Church is by a necessary and natural transition the fulfillment of the Church of Promise. The next addition, matutinae (Matins), a practice which had developed from a vigil service, was enshrined by the Emperor Justinian in 530 and placed before Lauds. As the three great public hours (Lauds, Vespers, Matins) became formalized into ecclesiastical practice, there was a concomitant development of "private prayers" which over time were added to the Office. Derived from the ancient Jewish custom of praying at the Temple during the third (9 a.m.), sixth (noon), and ninth (3 p.m.) hours; Terce, Sext, and None eventually became known as the "Little Hours." Growing up quietly and apart from the official round of public worship, we find from the time of the Apostles three little 'Hours'.... This custom was continued by devout Christians of leisure, men and women who had dedicated their lives to God. These, known as the Celibates and the Virgins, would gather together for prayer at these traditional hours on weekdays either in a private house or in a church. Later, when such groups withdrew from the cities to form the first monastic centres, these three Hours were added to the regular	daily course of prayer. The six 'Hours' described above form a well-balanced daily cycle of divine praise. Vespers, Matins, and Lauds dedicate the time from sunset till dawn while Terce, Sext, and None intercept the working hours of the daytime. All of these 'Hours,' the three greater and the three lesser, are linked to the Mass of the day by the Collect. Rounding out the day are the hora prima (Prime), the second morning prayer, and Completorium (Compline), the second evening prayer. Both became regularized by the 8th century with Prime's first recorded appearance at St. Jerome's monastery in Bethlehem, while Compline was a part of St. Basil's ritual at night during the times when there was no vigil office. The office of its very nature is public and choral worship, even those who join in it privately should not be ignorant of the conditions that govern such a form of prayer. For indeed the Office is not and can never be private prayer, but however presented, it remains the Church's own social offering of	praise to God, and all those who take part in it, whether publicly in church, in the seclusion of a hermit's cell, or on a bed of sickness, join in it not as private individuals only but always as members of the choir universal, in the audience chamber of the most high God and in the presence of the Angels. Despite a brief resurgence in lay involvement with the Office during the 1950s, especially in the United States, due, in large part, to the re-emphasis on the chant by the great St. Pius X, there had been a gradual decline in its public recitation beginning at the time of the Protestant revolt. There are a number of factors which contributed to this eclipse, the most obvious being the tragic break up of Christendom and, in its wake, the rise of the secular nation state and its embracing of the now sacrosanct "separation of Church and State" doctrine. After a couple of centuries, this ruling tenet has been immensely successful, going beyond its original intention and has achieved what many of its proponents had wanted all along: the "separation of man from his Creator." Another cause for the Office's decline has been the popularity of private devotions and, more disturbingly, in modern times, an overemphasis on apparitions, especially those of the Blessed Virgin. Zeal for events such as Fatima have, unfortunately, superseded devotion to the Mass and Sacraments and have taken on cult-like status. Even within traditional circles, the Most Holy Rosary is often spoken about as the pinnacle of Catholic prayer life, while the Office is rarely discussed. It must be remembered that "a hundred private prayers," as St. Alphonsus Liguori once remarked, "have not as much efficacy as a single petition offered in the Divine Office." Through the Incarnation, Passion, Crucifixion, Death, and Resurrection, mankind was graciously shown the true purpose of life: to obtain eternal salvation. The Divine Redeemer provided the means for the attainment of this end through the establishment of the Sacraments. Over time, mankind, especially Western man, recognized this and created societies where the Mass, Sacraments, and Office became an integral part of life. The fullest flowering of Christianity came forth on European soil where the Office and Mass could be heard chanted from the magnificent cathedrals, to the remotest monasteries, in the crowded walls of parish churches, and in the humblest of chapels which dotted the landscape. Tragically, however, man has forgotten the supreme Sacrifice of his Redeemer and the reason for his creation. The great structures built for the glory of Almighty God are now mostly museums, venerated not as places for Divine worship, but, instead, for their aesthetic beauty. Modern man now hedonistically builds, as did his pagan Roman ancestors, stadiums for godless sports games. Worse, yet, the very institution which was the conduit of sanctifying grace between heaven and earth has been infiltrated by the diabolical, which has inspired its current corrupt stewards to replace the Mass, Sacraments, and Office with false, banal, and man-made substitutes. Why any true Catholic would consider speaking, never mind negotiating to rejoin, with some of the very individuals responsible for the overthrow of the traditional Faith goes beyond disturbing. It is long past due that the Divine Office, preferably the unadulterated pre-1945 books devoid of the horrible Psalter re-translations executed by the Jesuits under Pius XII, be reproduced and made readily available not only for the religious but also for the laity. What a contribution a publisher could make not only for the restoration of the Faith but also for the glory of God, to engage in such a task. St. Augustine's adage that "to sing well is to pray twice" should be heeded by modern man and, in particular, the Conciliar Church, which will certainly need to atone for the untold blasphemies, offenses, and crimes which it has committed against the Catholic Faith. The return of the Divine Office to its rightful place of prominence would be a wise step, which just might mitigate some of heaven's vengeance.